A coyote appeared suddenly, 50 yards downwind of my position. The wily dog weaved between spruce trees, offering me no shot opportunity. With the distance closing fast, I knew at any moment he would pick up my scent and the jig would be up. Fortunately, he kept coming and at just 10 yards, he suddenly stopped, finally smelling something that just wasn’t right. At that precise moment, my rifle cracked, and a single .223 round put that coyote down for good. I am not absolutely sure what happened that day; maybe that particular coyote wasn’t exactly the smartest of his breed. Instead, however, what I would like to believe is that I would not have shot that coyote had I not take extensive measures to control my scent. I believe that many times when hunters fail to succeed in shooting coyotes, they simply have not taken the proper measures need to adequately control their scent profile. When the stakes are high and we are chasing whitetails, it is easy to invest the time and energy required to control our scent. When hunting coyotes however, maintaining that same level of discipline can be difficult. Scent control is not rocket science and even a basic level of scent control, when hunting coyotes, will often go a long way in allowing hunters to put more fur on the ground. No-scent soaps and deodorants are effective but should be used each day 3-4 days before hunting to ensure that residual smells from scented shampoos and body washes are eliminated. Also, wear hunting clothes no more than two outings before rewashing in no-scent laundry soap, drying and then storing in sealed plastic bags with spruce or pine boughs. 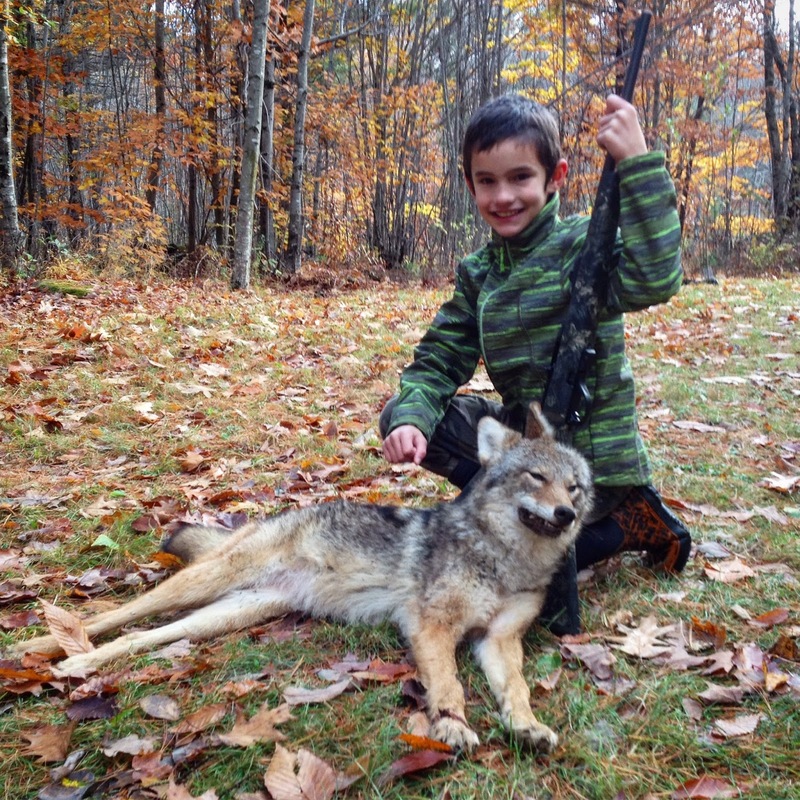 Done right, more coyotes will see their last Maine winter. Hunting coyotes is practically a sport in Down East, almost as exciting as the high school basket ball tournaments. To get in on the action, use the Stud Mill road to access a massive road network, providing access to thousands of miles of prime coyote hunting opportunities. One of my personal favorite spots is located in and around Cranberry Mountain (DeLorme’s The Maine Atlas and Gazetteer (MAG), Map 35 E2) and Lower Sabao Lake (Map 35, D1, E1) both of these areas hold enough song dogs to make any hunter happy. West Grand (Map 35, B-3, B-4) exists as a hugely successful salmon fishery, standing as one of the premier salmon lakes in Maine. The lake’s 14,340 acres and 128 ft watery depths provide excellent habitat for salmon, perhaps one of the most consistent salmon fisheries in eastern Maine. The lake provides superb habitat for coldwater sport fish, yielding trophy sized togue and salmon every season. Currently, the lake is being managed by Inland Fisheries and Wildlife (IFW) to produce a high percentage of 2-pound salmon. Salmon caught by ice anglers typically range from 17 to 19-inches with the chance to pull up a larger trophy fish always a possibility. In years, boasting high smelt population densities, between 40-50% of the salmon harvested weigh 2 pounds or greater. Show me a map of West Grand Lake and it would be difficult to indicate a specific spot where I have fished and not caught many fine salmon. Whitney Cove, the Throughfare, Hardwood Island, Pineo Point and many, many other locations are great choices for catching old silversides through the ice. Anglers targeting salmon will encounter more success if they bring smelts. While salmon will bite shiners, a much larger degree of success will be managed by those willing to invest a little more expense and effort and use smelts. If unaccustomed to using this baitfish, know they are notoriously difficult to keep alive. Bait buckets equipped with small aerators will increase the chances of keeping bait actively swimming all day long. West Grand Lake should not be trifled with any time of year but especially during the winter. Those wishing to fish its icy depths need to have a backup plan should weather turn nasty. This plan should include extra layers of clothing, food, fire starting materials and being sure to leave an itinerary with someone should you not arrive back home by a specified time. My idea of the perfect snowmobile ride includes a maximum of about 50 miles of trail done at around 10-20 miles an hour. At this speed, a rider is able to fully appreciate his or her surrounding and enjoy the beautiful scenery that the Maine winter offers. Often, I see riders flying down trails and across lakes at such unsafe speeds, it has me wondering why they appear to be in such a big hurry. It isn’t that I am an old fossil; it’s simply that I enjoy taking things slow. When I ride, I like to take my time and enjoy the moments spent outside, I stop to talk to ice fishermen, other snowmobile riders, cross country skiers and have even been known to stop at a store to get a snack and drink piping hot cocoa. If looking for a slow ride with plenty of beauty and nice places to stop for hot drinks and an afternoon snacks, I suggest taking a ride on the Sunrise Trail (http://sunrisetrail.org) from Machias (Map 26, C-3) to Dennysville (Map 27, A-1) or Cherryfield (Map 25, D-2). This scenic trail passes through some beautiful country and can be accessed by parking at the causeway in Machias. While the scenery is spectacular, even more fun is stopping after a long afternoon of riding at Helen’s Restaurant in Machias for a hot cup of coffee and a slice of one of their delicious pies. Can't wait to get up to the Throughfare sometime in May and flip a few flies..Hand Chisel? Oh yeah I remember it well... my ol' man making the ice chips fly with it..